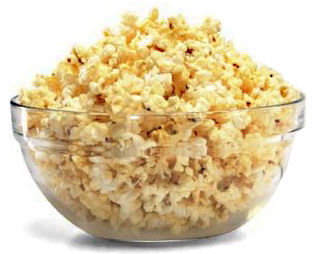 Most people have tried popping corn at home, but there’s almost always something wrong with it. It might be gummy or hard or burned or not crunchy or any of a bunch of other problems that make you willing to pay $8 for 20 cents worth of popcorn at the movies. First we need to talk about tools: You need a pot and a lid. But probably not the pot or lid you’re thinking of. It needs to have a heavy bottom for even heat distribution and be at least as tall (or taller) than it is wide, since popped corn takes up a lot of space. If the pot is too short, enough corn to cover the bottom will overflow the top. Next we need a lid, so the corn stays in the pot and not all over your floor. However since moisture is the enemy of crunchy popcorn, you absolutely don’t want that nice tight lid that came with the pot. What works much better is either a strainer or colander that’s large enough to cover the top of your pot. 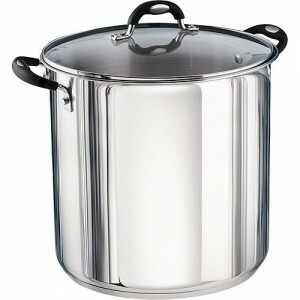 To that end, my favorite combination is a tall pasta/stock pot and a big strainer to use as a cover. Last we need to discuss the actual popcorn and oil. There’s absolutely no need to spend $4/Lb for any corn sold by a white-haired guy, or that has the work “gourmet” on the package. You do want the freshest popcorn you can find, which means that you want to buy from a place that sells a lot of popcorn. So far my favorites have been WalMart “Great Value” popcorn and Wegman’s Store brand. The oil needs to be Peanut Oil because of it’s high smoking point. Popcorn uses a lot of heat and to borrow a phrase from Alton Brown, burned oil is not “good eats” . However that’s enough talk Let’s cook! If you’re going to use butter, place it in a small cup and microwave for about 40 seconds or until melted. Add 3 or 4 kernels to the pot. Cover pot with strainer, put on stove burner, set to medium-high and wait for all four kernels to pop. If the oil smokes before all the kernels pop, you probably have old corn and need to replace it. Immediately add enough popcorn to cover the bottom of the pot. Replace lid and shake back and forth. Continue heating, shaking every few seconds until corn is no longer bouncing off your strainer. At this point you can remove the strainer to let more of the steam escape. The corn will stay in the pot because the corn popping on the bottom doesn’t have enough energy to eject all the corn above it. Continue shaking sideways, and add a vertical shake every now and then to keep the corn from being packed in too tightly. When the popping slows, remove from heat and let it finish using the heat stored in the pot. Transfer to serving bowl(s). If you’re using butter, drizzle it on now, then sprinkle on the salt, if desired. Note that if you have a lot of unpopped kernels, you probably had old corn or not enough heat. Try a higher setting next time. If it’s too chewy, you might have had too much heat, try a slightly lower setting next time. I was really surprised how great the WalMart popcorn came out. It’s every bit as good as Orville Redenbacher, and is something like a $1.40 for a big bag, compared to over $4 for the OR. I won’t be buying any more expensive popcorn. There’s no just reason.